Were it so that I had a favourite laptop power brick, this would most certainly be it. I know that you generally stick with the default adapter that came with your laptop, but there are plus points to dropping £50 on a brand new one like the CoolerMaster SNA 95. Obviously the most likely of usage scenarios remains grabbing a third-party adapter when your original one craps out, but this one from Coolermaster offers more than most. For a start it is literally half the thickness of the adapter that came with the MSI GT740 I've been playing with - being only a few millimetres thicker than my svelte li'l mobile phone. It also comes with a handy cable-tie attachment that allows for easier storage on the go, but the standout option for the man-on-the-move has to be the addition of a USB charge-point based in the brick itself. This means you can charge anything with a USB connector by the adapter alone so you don't have to either have your machine on while you charge or get in the way of topping up your lappy's battery. 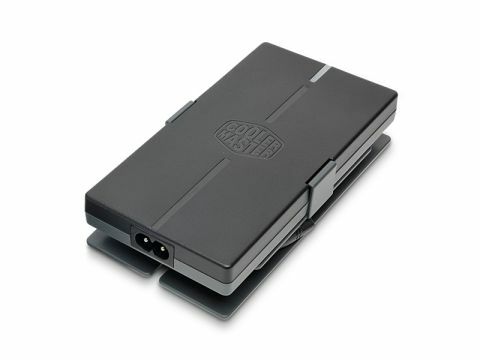 It's impressively connected too; coming as it does with eight different plug variants to cater for all the big boys, while Coolermaster also states that it can still provide operating power for other laptops with non-standard connectors though it might not charge the battery. For fifty quid it's still a hard sell when your current adapter is still working; £30 and it would have been a must-have for the travelling notebook owner. As it is it's still a mighty tempting little thing.